Derry’s reward for defeating Louth at Owenbeg on Saturday is a difficult looking second round draw at home to either Dublin or Meath. 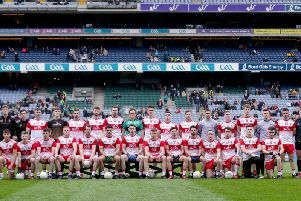 Derry haven’t face Dublin since an infamous 0-8 to 0-4 Division One defeat in Croke Park which led to a deluge of criticism for the Oak Leafers for perceived overly defensive football. Elsewhere in the draw, the losers of the Ulster semi-final replay between Cavan and Tyrone will be at home to Carlow in the qualifiers. Following Sunday’s draw, the Ulster rivals face a replay on July 3rd which may have a knock-on effect on the fixtures and once again raises question about why extra-time is not employed, especially since the minor semi-final was decided in extra-time on the day. Times and venues for all the back-door games will be confirmed by the CCCC on Monday afternoon.